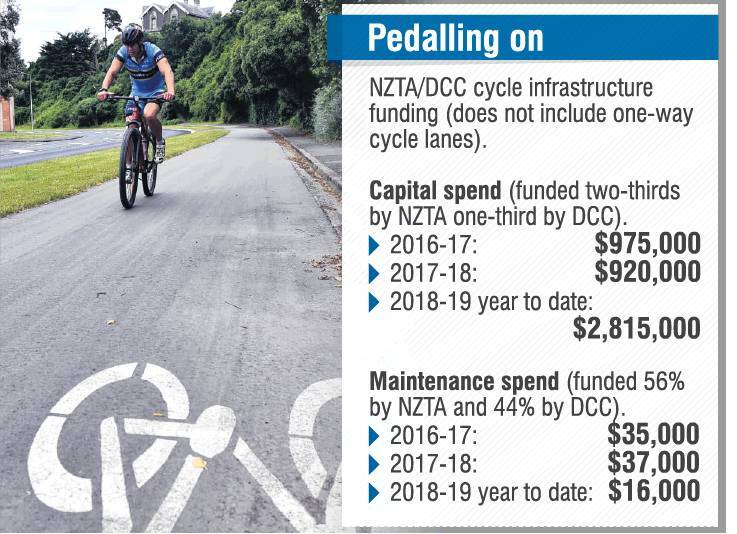 Dunedin's cycleways, not counting the city's one-way cycle lanes, have cost $4.7 million in the past two and a-half years. The city's transport manager says the work is forging connections that will serve Dunedin well in future. That includes the recently opened Leith Bridge that simplifies part of the route between Port Chalmers and the city, a route the NZ Transport Agency plans to complete by 2022. The Dunedin City Council plans to spend another $20 million on cycle infrastructure in the next 10 years. Council transport group manager Richard Saunders said the 2016-17 budget of $975,000 included $380,000 for business case preparation and design for the central city urban cycleway package and $595,000 for the Portobello Rd cycleway. The central city urban cycleway includes Portsmouth Dr and harbour improvements, the new Leith Bridge, Anzac Ave work and the connection through the rail corridor. The $920,00 spent during the 2017-18 year included $870,000 for central city urban cycleway implementation, a $20,000 business case and $25,000 for the South Dunedin network. Work on the Otago peninsula connection was under way, on the road from Vauxhall. NZTA was not far off going to tender for its extension from St Leonards to Port Chalmers. ''We think this package of urban cycle work is that missing piece to provide a really good experience around the harbour. Some of this year's budget included the resealing of the Portsmouth Dr cycleway. Tree roots were making the surface rough, and it was not the safest surface. The resurfacing improved what was a good connection for cyclists, pedestrians and runners. For the future, Mr Saunders said the council had recently sent its cycle infrastructure programme to the NZTA. In its 10-year plan, the council has set aside $20 million for improving and adding to the city's cycleways. Although a track running through the former Chain Hills rail tunnel linking Mosgiel to the rest of Dunedin was the most ambitious addition to the city's cycle network, the programme included connections from the city to St Clair and improved cycle infrastructure in Northeast Valley. The Anzac Ave part of the connection to the Leith Bridge and beyond was complete, and Mr Saunders said staff were in ''positive'' discussions with KiwiRail about connecting that section to the bridge. At present the path from the bridge leads to the corner of Wickliffe and Fryatt Sts. The plan was to run it alongside the railway line, through the council's St Andrew St car park to the railway station. That would allow users to cycle from Port Chalmers to the railway station on a shared path. I think 200 is an optimistic estimate. I drive past the cycleways on the one way at least twice a day and it's a rare occurance to see anyone cyling on them. I can say the same for cars on Stuart St when I head into work... usually only one or two on a four lane, separated stretch of sealed road. And for most of my ride home 90% of the cars I see are parked on the side of the road. Does this include the rework and who paid for the re work the rat payers of the contractor? Just for comparison, the DCC Roading and Footpaths costs for the last 2 years were $44 326 000 and $53 081 000. Almost $100 Million for the same period. Cycle-way cost will drop dramatically once complete. I do wonder where you get your 200 figure from OtagoIdeas? Show us examples of where the money has been spent, I have noticed over the years, road conditions (surfaces) have dropped in quality for the money allegedly spent on them. More money has been spent to appease a minority than is reasonable imo. We live in an age where one may extract "information" from their posterior and still expect it to be accepted as "evidence" by some, however unrelated to one's digestive health it may be. Before committing ten of millions a business case must have been developed. That business case surely had survey data showing numbers of cyclists in the city and surrounds. Particularly commuter cyclists. The business case would also have estimated growth in users over given periods. So here we are, millions spent, tens of millions more promised. Come on DCC & NZTA, release the data proving the jump in users to date and comparing that to forecast growth. Or is this spend really just an ideological push and monstrous waste of money as many people believe. A quick search online didn't give any specifics for Dunedin, but the Ministry Of Transport 'Household Travel Survey" found 31% of NZers cycled in the last year. Make of that what you will , but I think cars have been king for too long. Billions spent in NZ alone. 1000s dead, 10's of thousands injured, air pollution, noise pollution, huge swaths of asphalt just about everywhere... the list goes on. Good on the DCC for encouraging alternate forms of transport. It would be nice if the dcc actually spent 20mil on the road surfaces for the majority of road users, not just just for a minority as is the case now. Harbour terrace and Balmacewen Rd being two examples of absolute shocking road conditions. Good maintenance of cycleways is going to be a considerable ongoing expense. I wonder if the DCC took that into account before building them. It would interesting to how know much it presently costs.